A few hours later, while I’m sitting at my computer, my wife came downstairs to use the exercise bike and the Nordic track, thus honoring her New Year’s resolutions. Outside there is glorious sunshine, but temperatures in the single digits (F) which preclude a taking the dogs for a much-needed walk. While my fingers dance on the keys and my wife chugs along on the exercise bike the sounds of dogs bounding across the main level permeates the basement ceiling. It sounds like a herd of elephants crashing their way through the house. Ginger and Mya, our now 11-week old golden retriever foster puppies, are locked in the kitchen using a doggie gate which they haven’t managed to climb over yet. 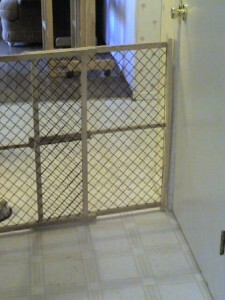 Doggie Gate: Basement door to the right, opens out. We discussed the commotion upstairs for a few minutes and decided that it was Jasper and Amos playing “run and chase” in the parts of the house that the puppies cannot get to. Jasper and Amos have run of the house when we’re not home because they never tear up stuff that they shouldn’t. The puppies do not have that luxury because they will tear up anything they come in contact with, so they are confined to a crate when we’re not home or to the kitchen when they cannot be directly supervised. The dogs upstairs are obviously having a blast. Up the stairs to the second level, back down faster than I can run, slide on the vinyl floor, only to turn around a go back up. Having lived in this house for 16 years, we can pretty much tell where people and dogs are by listening to the thumps and shudders of the house, from the basement. When my wife finally finished her workout, she hesitated before going back upstairs. We learned a long time ago that things change when the situation changes. The dogs are clearly having fun bouncing around the house. But when my wife goes upstairs, the game will end immediately because the dogs’ situation has changed even though they wouldn’t have gotten scolded for it. It always frustrates me when a dog does something really cute, but when I want to show somebody, the dog won’t do it….because the circumstances have changed….somebody else is in the room. Finally, my wife headed up the stairs. At the top of the only flight of stairs that leads out of our basement, she quickly discovers that the door won’t open more than a half inch. Wait a minute! “What do you mean you can’t open the door?” We live alone with our dogs. If we’re both in the basement and the dogs are upstairs, then why won’t the door open? Up the stairs, I went. Uh-oh. She’s right, the door won’t open. Uh-oh. We were wrong, the puppies are not confined to the kitchen. 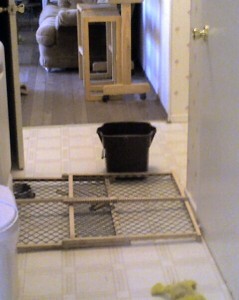 Somehow, the doggie gate had gotten knocked down and was now leaning at a 45-degree angle across the door. The bottom was still tightly wedged between the two walls. But, like I said, when circumstances change, the dog’s activities change. As I went back downstairs to sort through my tools looking for a long screwdriver or another tool that would fit through the half-inch gap that I could use to lift the doggie gate and open the door, the dogs ran past the basement door as if to say “Hi” and flattened the doggie gate to the floor. This, in turn, closed the door further and my half inch gap was the width of the thickness of a knife blade. Argh! Gee, that would have been too easy. Meanwhile, the puppies are freely tearing through the house with the big dogs hot on their butts. Yep, they were having fun! But only the kitchen is truly puppy-proof. There is the partially disassembled Christmas tree that makes for a great hiding place until the big dogs discover their ability to knock it over. There is the big dogs’ water bowl filled with a gallon or two of water allowing the puppies to drink all that they want. Young puppies rent food and water. Whatever they put into their mouths, comes out the other end within a few minutes. Draining the water bowl, with its gallon or two of water means 35 trips to the 15-degree backyard during the afternoon. Further, there are rolls of paper towels, and rolls of toilet paper within easy reach, once they’re out of the kitchen and running free and dozens of things that are downright bad for them. Working with the hanging file bracket, I quickly discovered that it wasn’t going to work. The bottom of the doggie gate is just an inch or two from the gap between the door and the door frame and it is still wedged tightly between the two walls. I can’t take to door off its hinges because as long as the door is closed, removing the hinges won’t let the door open either. Besides, they’re not on my side of the door. I could take the doorknob off and lower a hook down to the gate, but the screws to remove the knob are on the other side too. Except for a few small basement windows six feet or so off the floor, this door is our only way out of the basement. Okay, I guess it will have to be the window. Opening the basement window, we thanked our lucky stars that even though it’s cold, there is no snow on the ground to crawl through and we didn’t have a deep window-well around the window which might prevent my six-foot-five-inch frame from twisting through the window and out the window-well. 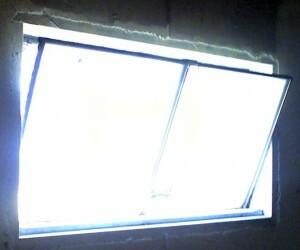 Unfortunately, opening the window as far as it goes, only creates a 3″ opening. I had to take the window out completely. Removing the window I found myself thinking happy thoughts about the house alarm being turned off at that moment. What could be better than crawling out the basement window just as the cops showed up? We’ve set the alarm off by accident a few times over the years. On average, the cops are there in 4 minutes or less. It was going to take that much time to climb out this window. Thank God the alarm is off. Standing on the chair, I discovered that I still wasn’t quite tall enough to fold my chest over the bottom of the window and crawl out. I had to jump a bit, without hitting my back on the top of the window or my head on the rafters. After a few minutes, I successfully crawled out the window; walked around the back of the house and used the keys already in my pocket to unlock the back door and walk back into the house. Once inside the kitchen, dog heads started peering around the corner from the other side of the downed doggie gate. One pup rounded the corner, hopped over the gate and trotted up as if to say “Hi, are you going to spoil our fun?” With one swift move, she was out the door looking at life from the cold backyard. Game over. 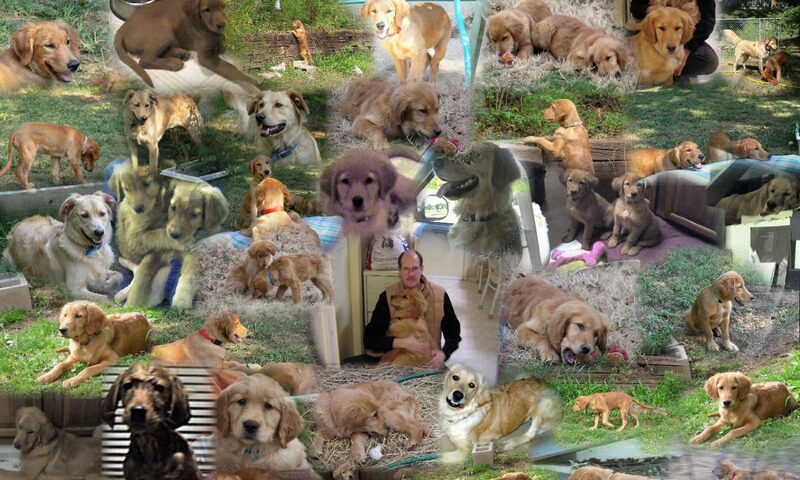 Tell me again why we foster puppies? On a brighter note, we have adoption applications to review, people to talk to, and dog introductions to conduct for both Ginger and Mya. Perhaps these two puppies will go to their forever homes, to make way for the Christmas puppies that usually arrive in March and April because despite everybody in rescue’s plea to not give pets as Christmas gifts, people still do. And then they discover that puppies grow up, require training, begin to shed, and aren’t as cute as they were in the pet store window.